Use the menu to the left to book your Hotel Room and view the Confernce Video. All events at DoubleTree Hotel unless otherwise noted. Participate in this Zero K fun run to support and bring awareness to the drive to end polio. All participants will start, “run” zero kilometers, and receive recognition awards for their accomplishment! District Governor Sandi will stand tall and present a special award to the best pajama outfit. Registration includes breakfast goodies, awards and all the fun you could ever hope to have in a Fun Run. 8:30 am - 9:00 am Free! Club delegates gather to vote on items which impact the Clubs and the District. Registration includes breakfast, lunch, and inspiring, informing and call to action sessions. Morning session is devoted to Human Trafficking with Nita Belles, author of In Our Backyard: End Human Trafficking. Deepa Willingham will lead a panel of experts who are working in the trenches and will share strategies and ideas that you and your club can implement to combat this modern day slavery. Our expert panel will include Doug Bennett with the Magdalene Hope Safe House, Dion Saiz from Truckers Against Trafficking, Dan Dow District Attorney for San Luis Obispo County and Diana Cisneros who is a school district trainer. At lunch time RI Director John Matthews will provide us his inspirational vision of Rotary. The afternoon session starts with the Speed Project Fair popularized at District STEPS conferences. Paul Chappell, author of The Road to Peace, and an acclaimed speaker, will kick off the session on Expanding Options for Peace. The panel following this keynote talk includes our speaker and representatives from Mediators Beyond Borders, and the Peace Corps, as well PDG Rudy Westervelt, convener of the 2020 Rotary International Peace Conference and PDG John Weiss (Peace Builder Club Chair). The goal of the day is for you to come away with knowledge of what can Rotarians and Clubs do. 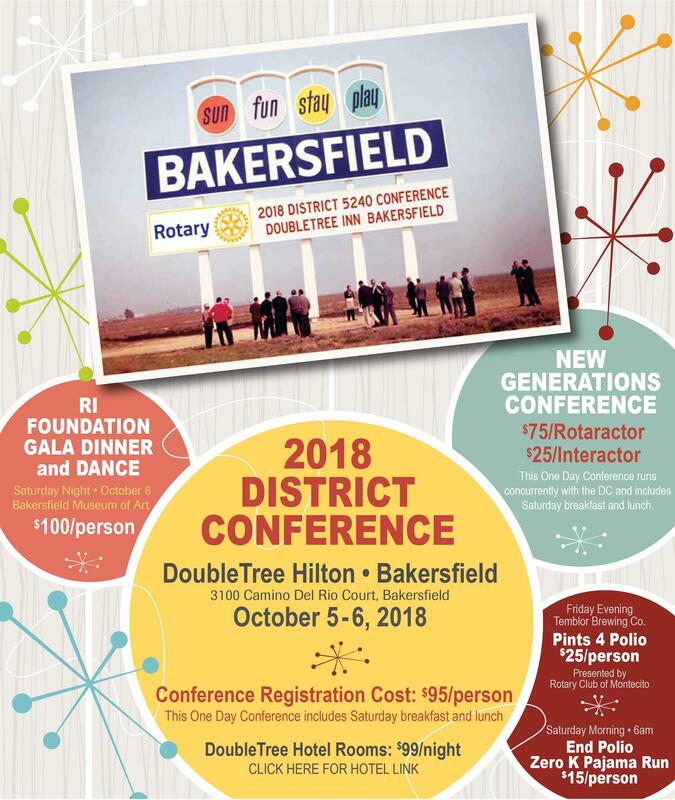 The New Generations District Conference for Rotaractors and Interactors is concurrent with the District Conference. Registration includes breakfast, lunch, service project, and an amazing, inspiring and informative conference. District 5240 Rotary Foundation Gala “In the Mood... to Inspire"
Tables of 8 may be reserved. Email your request to Carol Freeman: carolbfreeman@roadrunner.com. Include CLUB name and names of attendees to be seated at the table. ALL attendees listed must be registered to attend the dinner. Reservations cannot be done on Club Runner and will not be accepted by phone. Sorry, partial tables cannot be reserved. Would you like an exhibit table at the Conference? Your club or non-profit is welcome to reserve a free space at the Exhibition to share your project, advertise your fundraiser, or sell products that benefit your non-profit. We are also looking for select commercial vendors to sell or display their products. A form will be available from the left hand menu. Check back shortly. Registration for this event closes on Oct 1, 2018 10:00 PM. Thank you for your response to DoubleTree accommodations at the conference room rate! Our room block is now full. A few rooms may still be available at the hotel at a slightly higher rate. Fortunately, there are a number of highly ranked hotels within a half mile of the DoubleTree (3 minute drive). While we don't have negotiated rates with these hotels, the rates and availability are looking good, but reserve soon. This hotel provides shuttle service.